October 3, 2013, was when my life changed dramatically. The two days prior were just like every fall; getting the yard ready for winter with lots of manual labor. On the 3rd I just didn’t feel right, difficult to explain because I work hard every day and always feel great afterwards. Called the doctor’s office, she said go to the emergency room (since I just turned 69). She wanted to make sure nothing would be missed. Two weeks later I went home from the hospital after open heart surgery; three by-passes and one valve. Kind of took the air out of my sails. I was up and walking the first day, but having trouble with the rhythm of my heart. The first day after the surgery I woke from a nap and a new doctor was standing by my bed, Dr. Nowell; friend of Mark and Thad Forester. Not recognizing him from the surgical team I asked who he was. He was an Air Force flight surgeon resident in Dayton, Ohio, connected to the heart group operating on and taking care of me. He took an interest in my case and following my progress. He came to see me every day and pretty soon we developed a friendship. Unknown to me he spoke to my wife Nan during one of his visits when I was sleeping and she mentioned my passion for art, especially sculpting. She showed him my photo portfolio. The next day during his visit he asked me about my sculpting and asked me if I did life-like pieces and would I be interested in doing a piece of his friend. He told me the story of growing-up with Mark and Thad and what happened to Mark. I have been sculpting for about ten years, and seriously for seven after I retired. Also taking lessons (annual workshops) from a master sculptor in New York state for six years, but didn’t feel I was qualified to do portraits. So I told Dr. Nowell no because portraits are so personal and getting the true expression of a person’s inner being so very difficult. I didn’t feel I could do justice to Mark. Dr. Nowell gave me the web site for Mark which had photos if I changed my mind. I left the hospital and had a very difficult time physically and especially mentally. I had no intention of getting back to clay/sculpture work; the passion was gone! A couple months later I got on the web site and looked at the photos; all were shots taken by friends in the service; no real shots to make a portrait from, so I gave-up the idea again. One day I was so disgusted with my attitude I printed the photos of Mark that I might be able to use and opened-up my clay. I started working, which lasted just about an hour, but I went back down every day for an hour and I had the basic structure done in a week (normally I can do this in a day). In two weeks the preliminary piece was completed, but it was missing that inner being; just couldn’t nail it down so I called my good friend Ed (a great pen and ink artist) asked him to come over and critique the piece. He suggested some changes; which I did the next day. When you work in clay you can work the clay over and over by removing or adding or moving the clay until you get it the expression you want. All of a sudden you will see it and it is like a fireworks go off in your head; a wonderful feeling. The piece you see is my best expression of Mark; not having met him I only hope I did him justice; because like I said in the beginning, a portrait is a very personal thing not to be taken lightly. If I had not had the surgery I would probably not be here today; or had a severe stroke, would not have met Dr. Nowell, and had no intention of sculpting again. But now I am back to myself mentally and physically. 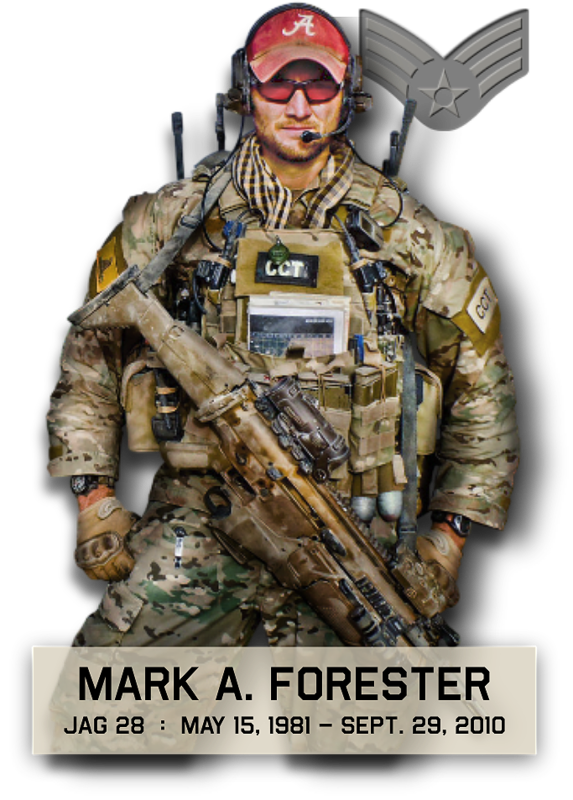 All this because of Mark Forester, a true hero in my life, who I never met. Thank you very much Bill. We are grateful you wanted to recognize our American hero. We’re also glad to know you’re back to great health and working in the yard. We will forever cherish this piece. We also appreciate Cliff getting to know Bill and his wife Nan, and for his desire to honor Mark. We have been blessed with many loyal friends across the country and globe. We are constantly amazed at the impact Mark has on so many.